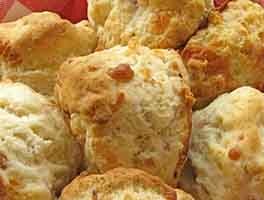 Biscuits are a delightful one-size-fits-all quick bread; perfect with soup, with stew, for breakfast with your eggs. 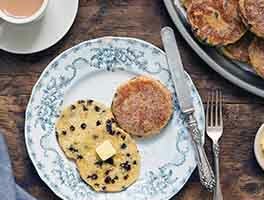 Sweeter than biscuits, scones have struck the American fancy and are showing up everywhere. Scones may be embellished with just about any fruit or flavoring that you can imagine. The following is a basic recipe to try in your new scone pan. It's easily altered by the addition of different dried fruits, nuts, chocolate chips, and/or spices. To make the scones: Preheat your oven to 425°F and lightly grease a standard scone pan. In a large mixing bowl, whisk together all the dry ingredients. Work in the butter just until the mixture is crumbly (see mixing advice in "tips," below). Stir in the fruit, chocolate chips, or nuts. In a separate bowl, whisk together the eggs, vanilla or other flavor, and liquid. Add the liquid ingredients to the dry ingredients and stir until evenly moist and cohesive. 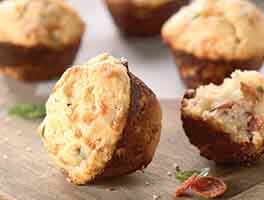 Using a muffin scoop or a generous 1/3 cup, fill each well of your scone pan. Sprinkle with sugar for topping, if desired; or leave untopped to glaze with icing later. Bake the scones for 15 to 18 minutes, or until lightly browned. Remove them from the oven and let them sit for 4 to 5 minutes to firm before removing them from the pan. Serve scones warm with butter and jam; or drizzle with glaze, if you like. To make the glaze: Stir together the glaze ingredients, adding a bit of liquid at a time until it reaches a drizzling consistency. Drizzle the glaze on the scones, let set for 10 to 15 minutes, and enjoy. 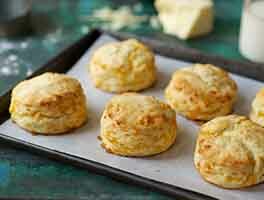 To make the biscuits: Preheat the oven to 450°F and lightly grease the wells of a standard scone pan. Whisk together the dry ingredients. Work in the butter or shortening just until the mixture is crumbly. Stir in the milk, buttermilk, or water. Scoop the mixture into the prepared scone pan. Brush biscuits with milk or melted butter for a shiny top (optional). Bake the biscuits for 18 to 20 minutes, or until lightly browned. Remove the biscuits from the oven and let them sit a few minutes before removing them from the pan. Store scones or biscuits, well-wrapped, at room temperature for a day or so. Freeze for longer storage. To save time on busy mornings, scone or biscuit dough may be prepared the night before, scooped into the pan, wrapped well, and refrigerated. The next morning, pop the pan into the preheated oven, and have breakfast ready in 20 minutes! To use King Arthur Flour scone mixes in the scone pan: Preheat the oven to 425°F. Lightly grease the pan; a light "spritz" of a non-stick spray works well. Prepare the mix according to the directions on the bag using the higher amount of water or liquid called for, if a range is given. Scoop the dough into the pan, dividing it evenly among the wells. Bake scones in a preheated 425°F oven for 14 to 18 minutes, until lightly browned. Remove them from the oven and let sit for 5 minutes, then remove from the pan. 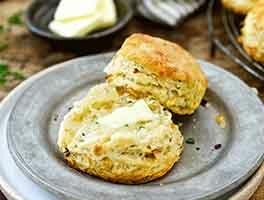 Making scones or biscuits is quick and easy. 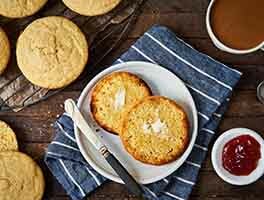 For best results remember two points for mixing: 1) Make sure the dry ingredients are whisked or sifted together so the salt and baking powder are evenly distributed; 2) The texture of the finished scone is largely determined by how you cut in the fat. It's best to use cold butter, shortening, or a mixture of both, and to leave the pieces about the size of small peas. If the shortening is cut in until the flour is EVENLY crumbly, you'll have mealy rather that flaky scones. I used eggnog in place of milk, it made a delicious replacement, I added a tablespoon of cinnamon and a tsp. of ground nutmeg to the recipe and some raisins for a perfect dessert scone. Made raisin scones. They were delicious. Especially appreciated the helpful hints. In the past I had cut in the butter bits to small. They were the perfect breakfast for a chilly, rainy September morning. Used dry milk powder and fresh whole milk kefir (great buttermilk substitute for any recipe). Made Pina Colada Scones with dried pineapple, shredded sweetened coconut and macadamia nuts. (Next time be more generous with the add-ins!) I topped the scones with sugar crystals and extra coconut, which looked just beautiful on top. I think coconut extract would be awesome instead of vanilla! I used vanilla because I didn't have the coconut extract yet. Froze dough on sheet while preheating oven, as recommended in other KAF scone recipes. Baked at 425 on KAF half-sheet pan and parchment paper, the bottoms became blackened with just 15 min of cook time. Tops lightly browned and perfect scone texture. My oven normally bakes true to temp, so should I lower the oven temp next time to 400? Baked less then 15 minutes, the next batch was a bit doughy so I had to bake a few minutes longer at a lower temp. Had to sub shortening for butter (ran out but REALLY wanted scones for brekkie) and it was still great. Noticed halfway though it was for a scone pan, which I don't own, so when I needed to knead it, it needed some more flour in that process, but that was just fine! I shaped it lightly into a round with my hands and then cut them into triangles (which is my normal process) and they've come out golden brown. I did not need to oil the pan, of course, for this method. Only 15 min cook time without scone pan. Made the basic scone recipe and added some raspberries (dehydrated in the oven for 3 hours) and white chocolate chuncks. Delicious!! These came out more like a muffin recipe than a scone. I like better a recipe for buttermilk currant scones that was one of the handouts for the King Arthur baking class that I attended in Washington, Bread: Principles and Practice. It would be great to see that recipe online here. This is a great recipe. I made it without the optional powdered milk. I added a tablespoon of lemon zest to the flour mixture, and sprinkled granulated sugar on top before baking. I baked them in a new ceramic scone pan that I wanted to try, and the results were spectacular. They were light, with a moist, tender crumb. I served them warm, with homemade lemon curd as a filling. I made them again with orange zest in both the flour and in the glaze. I have also tried substituting light olive oil for the butter with success, although that does alter the texture a bit. I have made scones in the past, but they were always more like doorstops. This recipe is perfect! This is a great MYO (make your own) scone recipe! I made Chocolate Chip Pancake scones by using KAF maple bits and mini chocolate chips. I did need to add a little extra buttermilk, but it is quite dry now, so that makes sense. This is a recipe you cannot live without. Made this for my new scone pan. My eight year old asks for it at least three times a week. I have tried several combinations but our favorite so far is blueberries with extra vanilla. Super easy to make my little one helps and could probably do it by himself. We were wondering if there was a way to have chocolate dough? Adding cocoa powder and more sugar to the dry ingredients maybe?